Ahhh, it's a good day to be an ice cream reviewer, you want to know why? Because I found a new little friend today! (sorry, DQ is on hold until at least tomorrow). The funny thing is, I was just talking to someone about how it's been a while since I've really been wowed by Blue Bunny. Super Fudge Brownie started slow, and ended ok. Bunny Tracks is a whole other story. The exact description is vanilla flavored ice cream with thick fudge and peanut butter caramel ribbons, chocolate covered peanuts and peanut butter filled chocolate bunnies. It does sound potentially good, but I've tried other flavors with similar descriptions only to be disappointed. 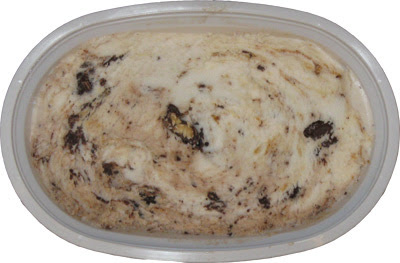 From the very first bite, you're going to realize Bunny Tracks is a special flavor that should please anyone who loves chocolate with their peanut butter. It's been awhile since it's happened, but this is one of those flavors where you take your first scoop and go "whoa, what was that? that's not what I expected". I was prepared for boring, bland or buttery, but instead I got bite. Oh yeah, when chocolate and peanut butter come knocking on the door, they better be prepared with that salty textured zest I crave. I had my first bite and immediately needed more. Just look at the scattering of mix-ins. Within four or five bites, I was won over, and do you want to know why? This little bunny bowl reminds me of my love of Reese Peanut Butter Cup blizzards. As long as they aren't over-blended, PB cup Blizzards have that awesome melty yet ice cold creaminess mixed with the chunks of perfection known as Reese Peanut Butter cup bits. I love those blizzards with a passion and I'm really diggin' this treat right now. With the Super Fudge Brownie, the brownie bits were small and just didnt make that big of an impact. Again, bunny tracks is the total opposite. There is some kind of tasty crunchy bit in every bite. Whether it's the cool little bunnies or the chocolate covered peanuts (or both), you get something in every bite. I really do need to stress that these aren't the mellow, saltless, textureless peanut butter cups like the ones in Ben & Jerry's Peanut Butter Cup. No, these bites are distinct and pleasantly crunchy. Yet again I'm remind of a tasty blizzard that hopefully has pb cup bits in every bite. technical note: the pb bunnies are smaller than a penny here, while the bunnies in Alpine Strawberry were bigger than a penny. This isn't a problem, but when you first scoop one, your brain will go "hmmm, this bunny seems smaller than last time". Overall, I am very pleased with this flavor and I was so sad to see it go. If I had bought two of this flavor, or if I had a bigger container, I totally would have gone in for a second bowl. It's just that good, go try some! The only plausible complaint you might see below here is that the fat content is a little high, but this is peanut butter ice cream we're talking about, so you're going to get some added protein with that extra fat. Hi there! Enjoy your reviews! I was wondering have tried Blue Bunny's Peanut Butter Panic? It's peanut butter ice cream with peanut butter cups, chocolate and peanut swirls running through it. Delicious! It's actually on my to-do list but I'm trying to get it in pint form so I don't have to have a giant container. Hopefully this one gas station will finally cave into my demands. I just saw a commercial for this ice cream less than 5 minutes ago in Southern California. I can only assume that it's back!